So I’ve mentioned that I continued Black Friday tradition this year by shopping with my best friend and her mother. Now, her mother didn’t join us for our Target excursion; instead, she headed to the mall to stake out Bath & Body Works (B&BW), also opening at midnight. Our B&BW target was the annual VIP bag, a purchase-with-purchase special for the day that included a variety of fun, I-don’t-really-need-these type of items (which *ahem* were a bit leaner compared to the 2010 bag and most noticeably did not include last year’s coupon for $10 off a $10 purchase). 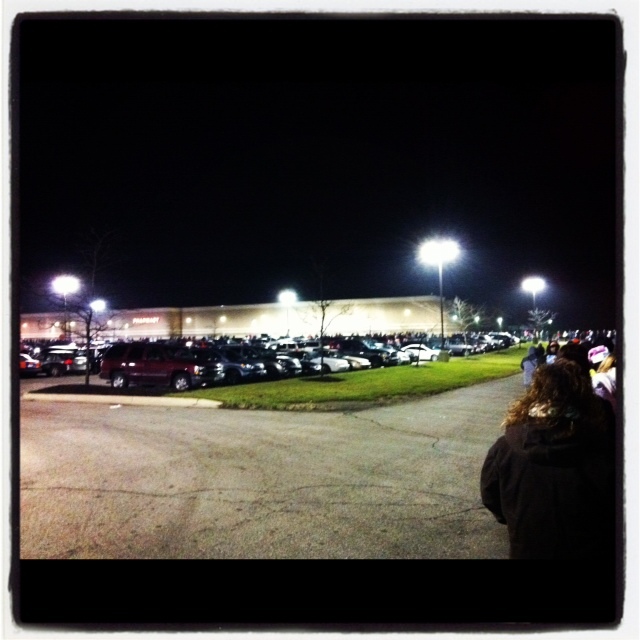 However like moths drawn to a flame, we Black Friday shoppers needed this “deal.” And, given the line at Target, we didn’t think we’d make it over to the mall in a sufficient amount of time. My friend’s mother was sent to B&BW with instructions to grab some of their $10 three wick candles (enough to use a $10 off $30 coupon and qualify for the VIP bag). Much to our surprise though, by the time we made it out of Target (12:25pm) and over to the mall, my friend’s mother was still in line at B&BW! Yes, that’s right, our shopping trip to Target was quicker than B&BW. Thus concluded our destination Black Friday shopping until 5am, when Toys R Us would tempt us my friend back with a new round of deals. To be perfectly honest, I find it hard to recall all of the details of this four hour timespan; perhaps this is where a few hours of pre-shopping sleep would have been beneficial. I actually had to check my receipts to see where I was and what I bought (just slightly reminiscent of The Hangover­). During this time, we stopped at Macy’s (used $10 off $25 and $20 off $50 coupons for a couple of gifts). At 2:30am, I purchased a crystal gingerbread man ornament with a $10 off $10 coupon at Elder-Beerman. (You can categorize that purchase under “Strange Items One Buys in the Wee Hours of the Morning on Zero Sleep”). At some point during this time period, we did refuel at the food court, which was crowded with people. I think that this was one of the biggest differences I noticed this year compared to past. Traditionally, I think when you head over to the mall at – say – 4am on Black Friday, you don’t begin to feel really hungry until 7 or 8am, after you’ve hit your destinations. This year, I felt that a lot of people (i.e. teenagers, other youngsters, non-serious Black Friday shoppers, window shoppers, and other “roadblocks”) went to the mall to hang out for an hour or two – and to grab a bite to eat. 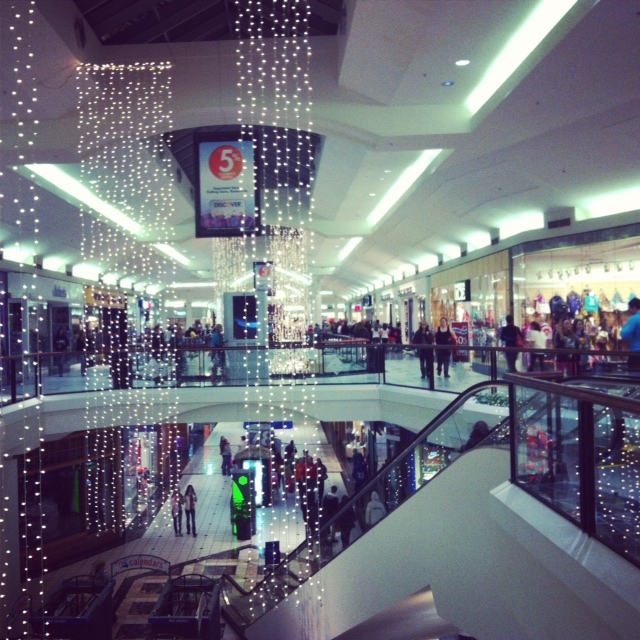 So the mall was crowded, but the stores within the mall were manageable – somewhat like busy weekend traffic. When I explored Gap, associates were straightening clothing stacks; we saw the same scene at The Children’s Place, American Eagle, and a few other stores that opened extremely early. I didn’t even have to wait in line at Elder-Beerman to buy my crystal gingerbread man – which helped to make this a completely impulsive purchase. The “sad” part about shopping so early on Black Friday is that, while we scored some great deals at Toys R Us, Target, and B&BW, we missed the 5am and 6am openings of several specialty stores (including my personal favorite, The Limited). And by 4am, I was so desperate for caffeine that I waited in line for Starbucks to raise their gate. At 5am, we were nearly cooked. Our shopping excursion ended with a stop back at Toys R Us (where the checkout line was infinitely shorter than during their 9pm opening) as well as Walmart, which was empty (not merchandise-wise, but people-wise). At Walmart, not only did my friend find the items that she was after, but we walked right up to the checkout. I was shocked to see that they were even polishing the floor of the optical center. (The lesson here: if you aren’t in need of a doorbuster, wait for the initial crowd to dissipate). In the past, it’s been tradition for us to enjoy a 9am lunch post-Black Friday shopping and call it a day. This year, though, we were so tired after our last stop that we couldn’t even fathom making it until 9am. Maybe next year! – The Buddy System Rules: Late Thanksgiving openings meant that a lot of shoppers (including yours truly) were pulling all-nighters to procure their deals. Shopping with a group kept us motivated, prevented us from falling asleep in line (and behind the wheel), and increased gift finding/buying efficiency. – Browsers Need Not Apply: If your goal for Black Friday is to look around and people-watch, perhaps you should find some better entertainment and roam the mall on another day. Taking up valuable parking spaces, clogging aisles, and usurping benches really only irritates Black Friday shopping pros. – Know Your Sales: Brush up on sales, deals, and offerings before you head to the store and have your non-expired coupons in hand (and not buried in the bottom of your pocket or purse) at the checkout. Those behind you in line will be grateful for your efficiency. – Night Owls Got the Doorbusters, but Early Birds Still Found Worms: It was truly physically impossible for our group to begin at 9pm on Thanksgiving and shop past 6am the next morning. Unless you were looking for a doorbuster at Target, Walmart, Toys R Us, or one of the other stores opening up on Thanksgiving, beginning at 5/6am on Black Friday still afforded you a lot of deals, a few hours of sleep, and un-ransacked merchandise at those specialty stores that didn’t herald a midnight opening. – Remember the Spirit of the Season: Getting up early or staying up all night makes it easy to get a case of the cranky-pants. Dial down the tension and recall that [most] shoppers are in the stores to GIVE this season. If you have to fight with a fellow shopper to save few bucks on that perfect present, that present really isn’t perfect, is it? 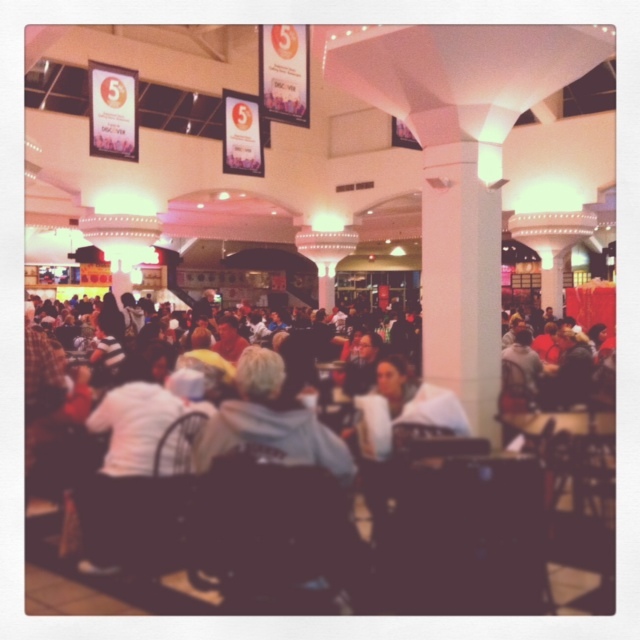 Remember, for more Black Friday insights, you can head over to the National Retail Federation’s Holiday Headquarters. The highlight of my Black Friday? 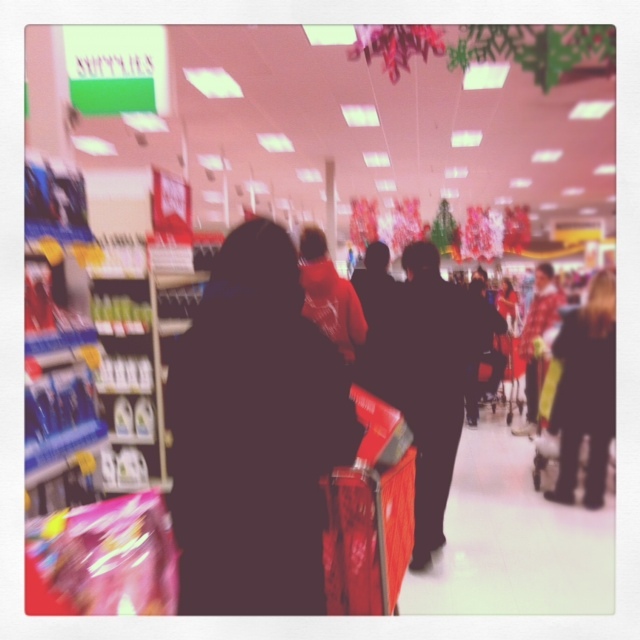 The 30 second checkout at Target…but more on that in a bit. Black Friday shopping is tradition for my best friend, her mother, and me. We’ve woken up before the crack of dawn for nearly twenty years since before we could drive, but this was the first year we headed out on Thanksgiving night. The 9pm specials at Toys R Us were just too good for my friend (a mother of two) to pass up. In order to keep the image of the perfect Thanksgiving intact for her young children, we started out after they were tucked in for bed. 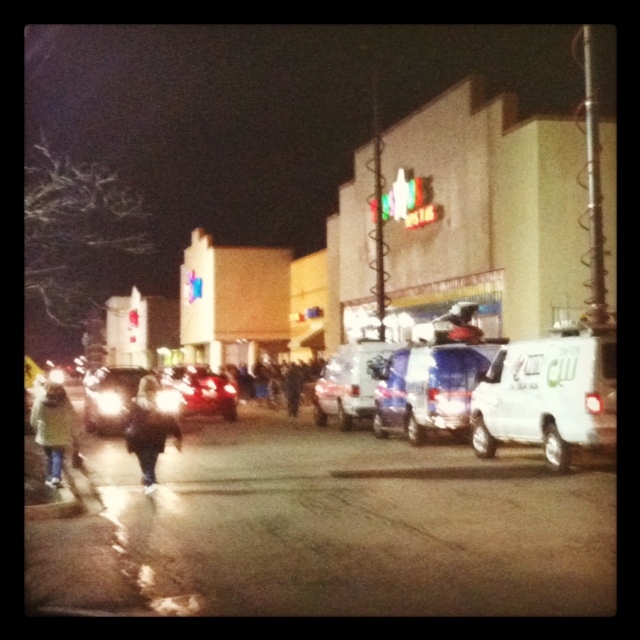 We arrived at Toys R Us (TRU) shortly before they opened, as three local TV crews readied themselves to record the madness. Our destination TRU is located in a shopping center with five other big box stores, still closed for the night. 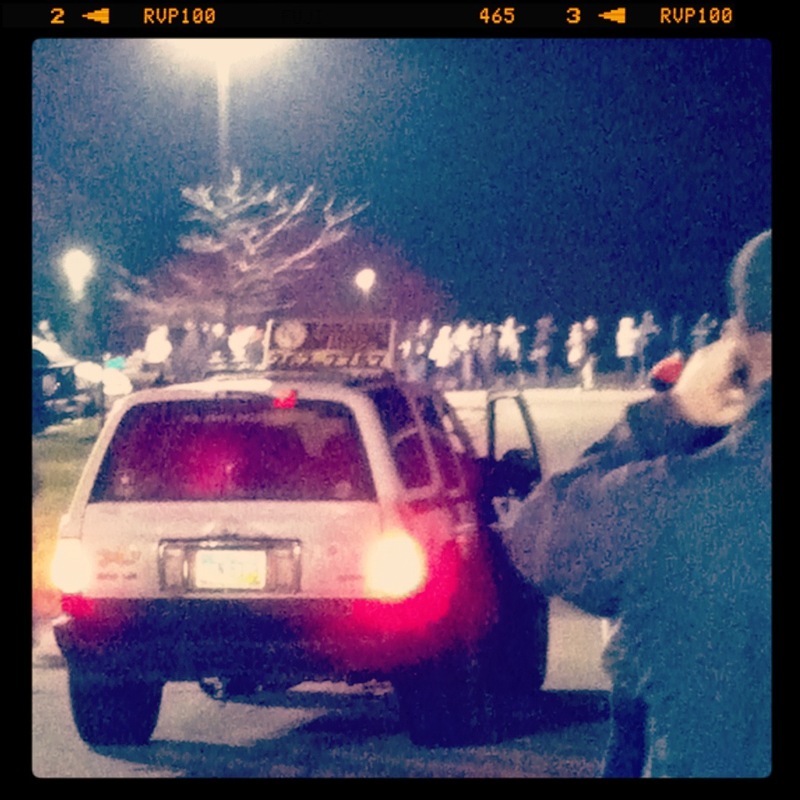 The line of shoppers stretched across the entire length of the shopping center, and we were at the very end of that line. It was nearly 10pm before we were admitted to the store. With no toys on my shopping list this year, it was my job to help my friend hunt down her deals (which seemed to be scattered randomly throughout the store). I left my friend to jump in line while she waited for a sales associate (and a ladder) to pull down the last of a doorbuster toy still in its shipping box WAY at the top of the shelving. Yes, the reasoning escaped me as to why said toy was in stock, yet not on the shelves…I was further confused when the store manager decided to nix the ladder idea and tell my friend she was out of luck. Once the manager was out of view, my friend scaled the shelving…while this action was a bit extreme – and dangerous – better customer service would have made this a non-issue. After standing in line for more than an hour, we finally made it out of TRU. As someone not buying for children, this wasn’t the best start to my Black Friday. But things picked up as we walked over to Target, located next door to the shopping center. It took us about 10 minutes of walking before we reached the end of the line at 11:15pm, which stretched across the store and down the end of the parking lot. A mutual friend met us here, and we waited for midnight to strike and Target to open. For the obvious reason, we were not the first group of shoppers in our Target store. On my list were some cheap DVDs and a doorbuster gift; my expectations for finding this doorbuster were not high, knowing how far back in line we were. As we shuffled closer to the store, the excitement in the crowd grew. Everyone seemed to be in a good mood, quite a contrast from the fist fights, brawls, and pepper spray incidents I later read about. As the first-in-lines came out with their deals, they waived to a cheering crowd. It was great. Surprisingly, the wait was quick, and we made in into the store at about 12:15am, splitting up and agreeing to meet at the checkout line. I found my DVDs and my gift – still in stock – and headed to the checkout at the same time as my friend. The “line” was surprisingly short; in past years, lines have woven throughout the store, so it’s likely that extended hours spread the volume of shoppers out a bit. No joke, we were out of the store at 12:25am. Quickest. Target. Trip. Ever. As we headed over to the mall, we received a call from our mutual friend…we had left her in our dust back at Target. Not a seasoned Black Friday shopper, she told us that she was still looking around in the store and was wondering where we were. She obviously wasn’t living by our Black Friday motto: Grab, Buy, Exchange Later. Black Friday adventures continue on Tuesday, so stay tuned. And for more Black Friday insights, collected over the weekend by BIG, head over to the National Retail Federation’s Holiday Headquarters. Each month, we ask respondents in our Consumer Intentions & Actions® survey if latest trends, newest gadgets, and even “it” personalities are Hot or Not. The Hot or Not List is generally comprised of input from our respondents, gathered in the previous month’s CIA® survey. We publish the overall results in the monthly Executive Briefing (see the November results here). 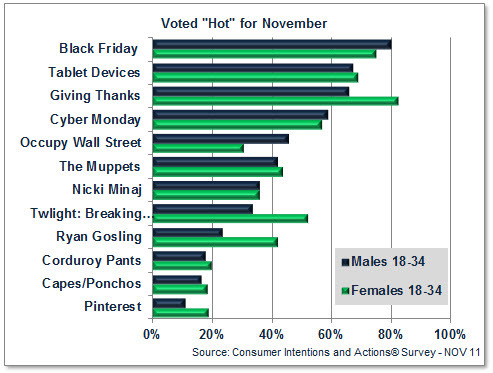 In a nutshell, adults in general voted Giving Thanks, Black Friday, Tablet Devices, and Cyber Monday as the hottest trends for November, respectively. But what’s hot is really dependent on age and gender, doesn’t it? What a teenager believes to be totes cool might not be the bee’s knees to a grandparent. (For the record, if you had to look up “bee’s knees” or “totes,” you probably have a completely different view of what’s hot or not). Besides Black Friday and Tablets, younger men also named Giving Thanks (65.9%), Cyber Monday (58.9%), and Occupy Wall Street (45.6%) in their top five. In contrast, the hottest item for young women was Giving Thanks at 82.5%…so these ladies are 25% more likely to vote for Giving Thanks than their male counterparts, who are busy giving thanks for Black Friday. Three out of four (75.0%) women 18 to 34 also voted Black Friday as hot, followed by Tablet Devices (69.1%), Cyber Monday (56.9%), and [swoon] Twilight: Breaking Dawn (52.1%). P.S. For more on Black Friday, stay tuned for our upcoming BIG on the Street post, where we’re planning to bring you highlights from our Black Friday excursion. With 152 million people planning to shop this weekend, it should be interesting. – Walmart enjoys loyalty in the South, while it’s a closer call between the two retailers out West. 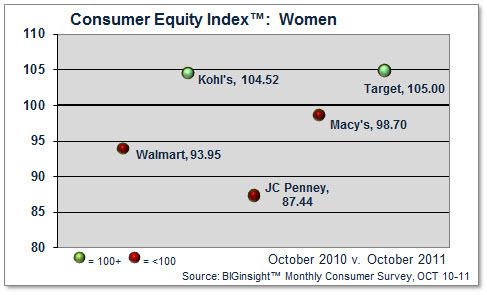 Here, we can see that Walmart is experiencing a 6% decline with Women, while Kohl’s is growing 4.5%. Among the top five retailers, JC Penney is faltering the most (at 12.5% decline). Macy’s is relatively flat, while Target is enjoying 5% growth. Now you understand: With Kohl’s growing in each major consumer group while Walmart declines, it was inevitable that these top retailers would tussle for #1. It should be an interesting New Year for this category…stay tuned. 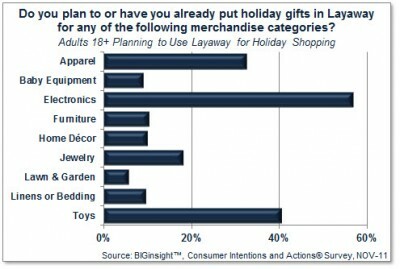 The results are in: more than one in ten consumers (12.2%) plan to utilize layaway for Holiday 2011. 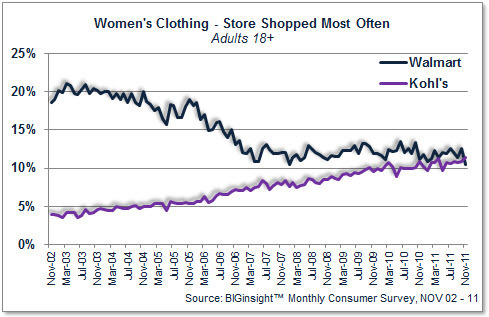 This number rises to 20.0% among Kmart shoppers*, 15.6% with Walmart shoppers, and 15.8% for Toys R Us shoppers. Best Buy shoppers index slightly lower than average (11.0%). So why are we looking at Best Buy shoppers? Best Buy doesn’t offer layaway. That might be too bad for Best Buy. A closer look shows us that among Best Buy shoppers planning to use layaway, 58.0% plan to put Electronics into a plan. And where are Best Buy shoppers most likely to use layaway services? That’s right, at Electronics rival Walmart. A holiday shopper knows no loyalty when it comes to finding the best way to maximize budgets and ward off debt. 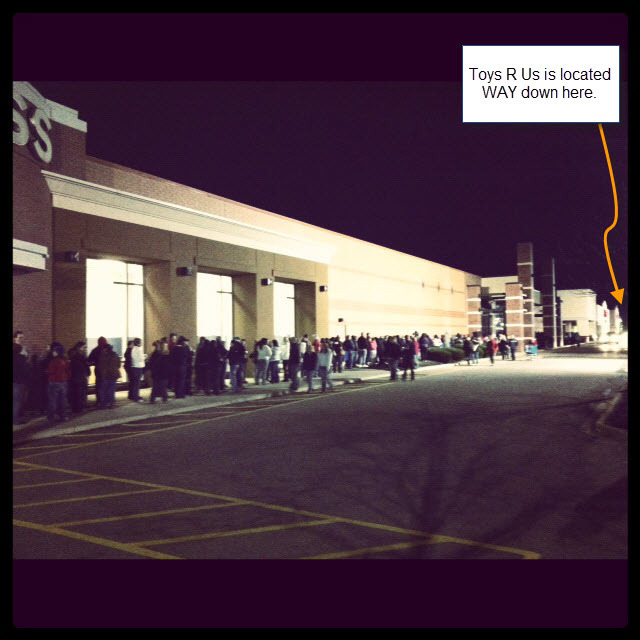 To be read as: Among shoppers planning to use Layaway this holiday season, 40.3% are planning to put Toys on Layaway. 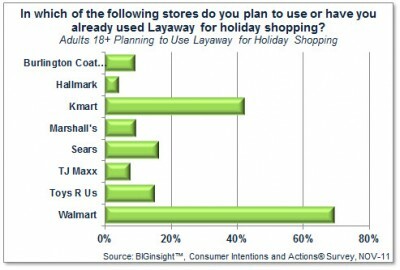 To be read as: Among shoppers planning to use Layaway this holiday season, 69.0% are planning to use Layaway at Walmart.